San Bernardino Pass (elevation 2,066 metres or 6,778 feet) is a high mountain pass in the Swiss Alps connecting the Hinterrhein and the Mesolcina (Misox) valleys between Thusis (Graubünden) and Bellinzona (Ticino). Located in the far eastern side of the Western Alps it is not to be confused with the Great St. Bernard Pass and the Little St. Bernard Pass. The top of the pass represents both the Italo-German language frontier and the watershed (drainage divide) between the Po basin and the Rhine basin. 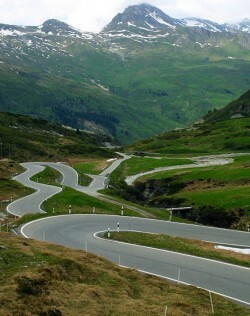 The pass is featured in an episode of the BBC television show Top Gear in which the three presenters try and find the best driving road in the world. “Actually the northern entry into the San Bernardino Pass is already down in Thusis, provided the fact that you are able to find the entrance to the Via Mala canyon on the south side of the village. Thusis, an old Saeumer settlement (Saeumer were logistics specialists in the Middle Ages) and hub in the Roman Empire to the Julier Pass and Septimer Pass had no significance, because the path through the Via Mala (bad route) canyon, as the name suggests, was very difficult and was for a long time only possible by mules. On this old pass road, which is absolutely the nicer version to ride up to the San Bernardino Pass, the postal buses torture themselves every day up to the hospice. There is of course also the possibility to use the highway, but then you’ll miss all the beautiful dreamy places on the way up to the pass. Bernardino Pass summitThrough the Via Mala, the old pass road winds along a beautiful and wild countryside, continue always at Upper Rhine River, through small villages until the village Hinterrhein. That’s where the highway disappears into the tunnel and the actual pass ascent of the old pass road begins. It is worthwhile to briefly do a brake in the Via Mala canyon and don’t become too confused of the tourist crowds flooding the place. In the lower end of the open canyon, directly after the tunnel exit and across the first bridge on the left, you still can see remnants of the old pass road and the old bridge head. Just take a short walk, passing by the tourist crowds, through the avalanche gallery and the old stone bridge that spans the gorge in the upper part. There you’ll find in two rock cellars from time to time beautiful exhibitions. After passing the Via Mala you’ll reach a high valley with the two villages Zillis and Andeer. Dont miss it to have a look at the Church of St. Martin in Zillis and directly after that to the exhibition in the building of the post of Zillis. You will learn a lot about, not only the wooden ceiling of the church, but also on the dam projects on Grimsel mountain. Take the way through the village Andeer, it’s worth it. Not only because of the old architecture, but also because of the dairies with the most sumptuous range of mountain and Alp cheese variations. Leaving Andeer the old pass road runs under the highway and then rises at Baerenburg uphill. Past the first dam of the power plants company Hinterrhein which also the Lago di Lei is part of its network we reach the famous Rofflaschlucht with the appropriate inn with the same name. Take a short break – visit the Rhine Falls – and oder one of the absolutely divine Roesti, the continue following the gorge climbing past the exit to Juf and the Lago di Lei, past the mountain fort and the lake up to the village Spluegen. Here you can exit to the left onto the Spluegen Pass road, which we don’t follow today, since it would bring us over to the Bergell and to Chiavenna. Passing through the small villages of Maedels, Nufenen and Hinterrhein we reach the parking lot in front of the tunnel portal and follow the old pass road upwards. The first section is just climbing serpentine by serpentine, always with a direct view down to the valley. Once you then reached the top of the pass, you’ll wondering to see so many motorbike tourists up here. What just a few people know and which is commonly practiced, is the so called pass roundabout racing. From Hinterrhein up and down on the southern side of the pass, back through the tunnel and up again. Thanks to the low car traffic this is a sport that is not only practices by Swiss motorbikeers. Pass summit hospiceAt the summit you’ll find a small lake with deep blue water and a hospice. When you look to the south you can feel already the heat from the Ticino flooding up the mountains. The descent on the south side is well construced but narrow. If you have made it curve by vurve doan to the village of San Bernardino, you should not miss a visit to the local gift shop. You the can meet the oldtimer “It’s cool men” from the Milka advertising. He is the owner of the shop and sometimes even willing to enter with you into a long conversation. Following the pass road downhill you may either again follow on the highway, or continue riding down the old pass road. About the village Pian San Giacomo you can follow the old pass road right down to Bellinzona, or at any time switch back to the highway, which runs almost parallel. We always manage it to the first half of the way. Then it’s time to stop and change clothes as the temperature rises to Bellinzona in Ticino in summer to about 35°C. Coming down the mountain summit with a motorbike where we sometimes only had 5°C in summer, knows what we mean. Alternatively, a 6.596m long tunnel runs through the mountain. Therefore, the San Bernardino Pass in general is open throughout the year for traffic and connects the Hinterrhein with the Misox and Ticino. What we also see frequently. Co-riders (mostly girls), sitting on the pass summit at the hospice for a cappucino, because their boyfriends are doing the pass roundabout racing.